Unfinished work, faulty installations and even legal trouble. There’s no question that choosing the wrong contractors can amount to serious financial headache. It’s important to do some research before choosing the right contractor – a bit of strategic thinking could save you thousands of dollars. We’ve all seen our friends and even some of our family lose money from unsuccessfully running their own renovations. Years ago one of our cousins became engulfed in a lawsuit with a general contractor that lasted four years and cost him thousands – not to mention the intense emotional stress. It’s very important to take your time when choosing the trade, contractor or builder that is going to be performing the work. We 100% guarantee that if you follow these steps mitigate risk you’ll end up with a beautifully complete project and more money in your pocket. If working with a small company, make a copy of the principal’s identification, including business registration documents, trade certificate and driver’s license. If working with a small company, try to provide the smallest possible advance. It would help your situation to prove you won’t leave them hanging so they are confident they will get paid in the future. Use referrals from colleagues, friends and family, or spend time doing a little research. A great website with user-generated reviews is www.Homestars.com. Not all small contractors will have their company listed. 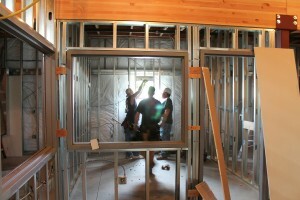 Visit another job site where the contractor is working. If they tell you they’re “Free at the moment,” it’s a bad sign. Don’t pay the contractor more than the percentage of work they’ve completed. Knowledge of the building process, building code and material costs will help in determining the amount of work completed. Visit their office and place of residence, if possible. If they hesitate, proceed with caution. Interview experienced contractors and keep asking them questions. Compare your answers with other contractors and see what they do differently. Knowledge is power! Something as small as using glue between drywall can increase sound suppression between units tenfold. It’s good to know what each contractor’s game plan is so you are comparing apples to apples. Some of the trade colleges have a member’s register which can help with choosing the correct contractor. If you’re hiring a plumber, electrician or a sheet metal worker then you’re in luck! Look up their registration info to make sure they’re certified. You can find this information on the college of trade’s online registry at www.collegeoftrades.com. Buy a copy of the Ontario Building Code and consider taking a course to learn how to use it. There are various versions so be sure to get the latest copy with an illustrated guide. Verify the work has been completed as per the building plans and the scope of work. During construction, ask the contractor questions about how they’re doing things a certain way, and compare it with the Ontario Building Code. Document in writing how each contractor/sub-contractor will perform the work. Work can be completed to meet building code requirements but in many cases can be done to exceed the minimum requirements in the building code at a minimal cost. Confirm no shortcuts are being taken by the contractor. They might make the job a little easier but the quality of work will suffer with every corner that is cut. Get a warranty for the work being completed. To rely on warranty work being completed you have to have confidence the contractor will be around in five years’ time and will actually cover the cost of the warranty work. Use trade-specific scope of work documents. Every trade has their own general scope of work that in most cases is missing details. Ensure that your scope of work addresses uniqueness in the work required for a specific task. Take lots of pictures throughout the entire project. Asking the general contractors of 3-5 different trades that can vouch for their integrity and confirm they haven’t had any past issues with payment. Having a solid contract detailing all the work to be completed and materials to be purchased. There are various standards; the most common are CCDC construction contracts. These contracts should include the drawings, building plans, scope of work and material specification list and timeline. Comply with legal holdback requirements per the Construction Lien Act. Setting aside the required holdback will protect you if there is a claim from the contractor/subcontractors that they haven’t been fully paid. By following these recommendations your chance of completing the project on time, on budget and without tearing your hair out is improved by 1000%.